The Cable Matters Cat5e Snagless Network Patch Cable offers universal connectivity to computers and network components, such as routers, switch boxes, network printers, network attached storage (NAS) devices, VoIP phones, and PoE devices. 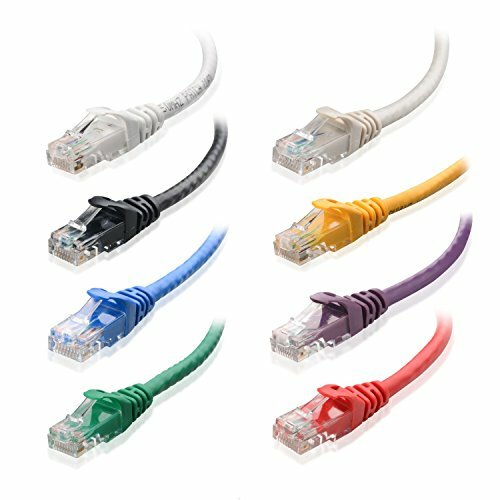 Color-code, customize, and organize your home or office network with our cost-effective and highly rated 8-color combo Cat5e cables. This cable provides outstanding transmission performance and low signal losses. It supports up to 350 MHz and is suitable for Fast Ethernet, and Gigabit Ethernet. All Cable Matters Cat5e cables are made of 100% bare copper wire as opposed to copper clad aluminum (CCA) wire, therefore fully compliant with UL Code 444, which requires pure bare copper wire in communications cables. Our Cat5e patch cables are used by data centers around the world. High Performance Cat5e, 24 AWG, RJ45 Ethernet Patch Cable provides universal connectivity for LAN network components such as PCs, computer servers, printers, routers, switch boxes, network media players, NAS, VoIP phones, PoE devices, and more. Comes with 8-pack Cat5e Ethernet cables in Black, Blue, Gray, Green, Purple, Red, Yellow, and White.